The aim of this study is to investigate the trends that appear in the Post-Panamax container vessel market. 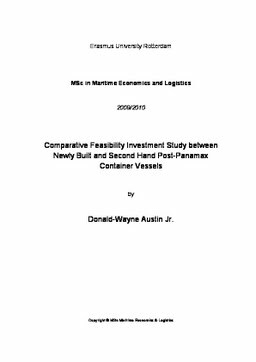 The objective of this dissertation is to forecast the NPV of newly built and second hand Post-Panamax containerships over a 10 year period. This will be done using a variety of mathematical models. The cash flows calculated are based on data provided from well known shipping firms in the industry. More specifically, information on delivery prices, operation expenses and time-charter rates for different sizes of Post-Panamax container vessels. The study is composed of three cases: newly built Post-Panamax container vessels, second hand five year old Post-Panamax container vessels and second hand ten year old Post Panamax containerships. The funding structure is based on best practice used by top ranking shipping banks. In order to obtain more in-depth results, cash flows were calculated based on different interest rates, to mirror the high volatility of the factor. The loan duration is ten years with twenty equal installments. The balloon payment is amortized periodically together with the principal payment at the end of the decade. Following the calculation of the discount rate, the NPV outcomes were compared to reach preliminary results for all cases. After the financial analysis, a risk-sensitivity analysis takes place in order to measure risk associated with each case. The risk analysis is based on twenty year spot earnings by applying thousands of iterations to reach significant results. Therefore, reliable conclusions were drawn, revealing that the ten year old second-hand Post-Panamax container vessels appear to yield higher returns to capital invested, regardless higher operating expenses compared to younger vessels.